Many people in therapy, personal development or spiritual growth circles talk about peeling away the layers of the onion. 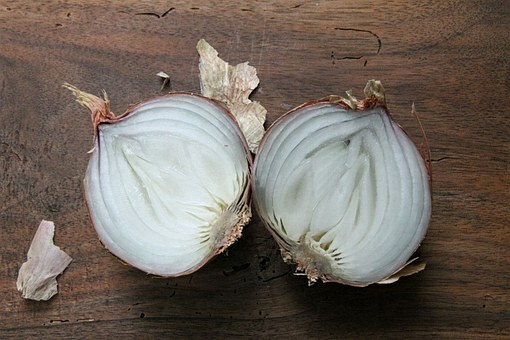 An onion has a distinct outer thin skin, a tougher outer layer under that and then lots of fresher layers underneath. Having a course of therapy or development work can start with a surface layer, or mask, which hides the tougher problem underneath. As the tougher problem gets peeled back, it can reveal another underlying issue beneath it. So a person may begin to deal with their exhaustion from trying to control so much and start learning how to relax more. They then find it's difficult to trust people when in need of support. Hence the talk of getting to another layer of the onion. For some reason I was pondering on this expression while waiting for my next client to arrive for their appointment. I pictured the onion being peeled one layer at a time and imagined the last, thin, spring onion-like bit you'd be left with at the end. "But that's not how my clients end up" I thought, so what was happening with my clients that wasn't the same as peeling an onion? When my client arrived, and began to share their story, they amazingly started to talk about these onion layers too, not knowing what I'd been thinking during my preparation! They then said "I feel that if I kept peeling back these layers there'd be nothing left of me". So I decided to share my understanding of what really happens when we work successfully with our issues and layers. Just like an onion, our body has a distinct, thin outer skin. This skin helps to define our outer physical boundary, along with body hair, toe and finger nails. Our skin has two layers: the outer epidermis and inner dermis. The epidermis is made up of dry, dead cells and a protein called keratin. The underlying dermis is a live layer of cells and is full of things like hair follicles, melanin pigment, blood vessels and much more. The next layer, under the skin, is a cushion of fat, which is also made up of cells. Deeper into the body we come to the muscles, organs and the density of the bones - all these structures formed by millions of cells of different sorts. Amazing. All these cells are held in place, and kept in their separate layers, by a massive network of connective tissue. Just as we have an outer layer of skin (epidermis and dermis), we also have an inner layer of skin or connective tissue, known as the superficial fascia. The superficial fascia envelopes the entire body, just beneath the skin. Fascia is a fibrous connective tissue that surrounds many structures in the body, in particular the muscles. it also holds the organs in position. In craniosacral therapy, this fascia is a vital focus for much of my work with clients. Over time, this fascia can become tight, twisted, dry or stretched out of shape. This can start right from the time we are born, when the body begins to twist and stretch on it's journey through the birth canal. Throughout life, the fascia can be strained or even torn, by accidents, operations or bad postural habits. Many people can feel knots in their shoulders or back and it's usually the fascia that's holding these tight spots in place. Fascia cannot be seen on traditional medical x-rays or MRI scans and there are no blood or urine tests that can detect issues with fascia. I believe this could be the reason so many people in physical pain, or with restricted movement, have a medical diagnosis that shows no cause for their problems. The hands-on technique I often use in craniosacral therapy is called fascial unwinding. From the two-year Diploma training, and then over eleven years of professional experience, I use specific hands-on contact to allow the fascia under the skin, and around the muscles and organs, to release tension and begin to unwind its knots and become naturally flexible and healthy again. As the connective tissues open up again, the body's natural fluids can begin to circulate freely again - such as the blood, lymph and cerebrospinal fluids. This release of tension and flow of fluids allows the 'onion skin' layers to soften again. Alongside the hands-on work there is also a process of verbal dialogue - talking and listening before and sometimes during the bodywork. This combined process can identify any stress, negative thought patterns, trauma or stuck emotions that have contributed to the tension in the fascia. This process gives freedom of thoughts, emotions and awareness, as well as physical freedom and energy flow. Where the body may have braced itself, perhaps with gritted teeth to make it through a crisis, that old tension can now be let go. In the safety of the therapy room a client can cry, laugh, swear, shiver, talk or yawn, until that past tension has been dissolved out of that layer of their 'onion'. As each layer of emotion and physical tension dissolves, the body can fill out with healthy fluids, deeper breaths and a clearer mind. When red blood cells are healthy they literally sparkle under a microscope! So as a person dissolves their onion layers they gain a glowing complexion and sparkling eyes. At the deepest level, their spirit is reignited and their soul can return its shimmering presence to those areas of the body that had been dry and cut off by past tensions. So when a Pathway Balancing client deals with their issues and reaches the deepest layers of the onion, they fill up with more of their soul, spirit and vitality. They become more of themselves, not less, and can be more creative, fulfilled, intimate and alive without all those tough, dead layers holding them back.